ADVENTURE TOGETHER is a FUN RUN and ADAPTIVE RECREATION fundraising event. 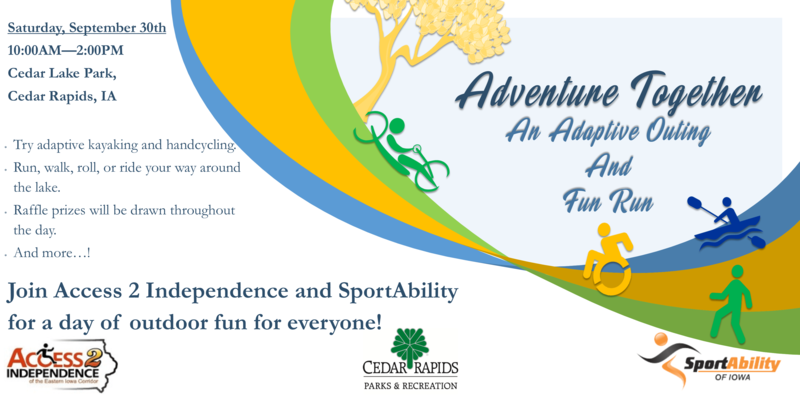 Participants can run, walk, or roll the trail while checking out adaptive KAYAKING and BIKING along the lake. The proceeds of this event will benefit SportAbility of Iowa & Access 2 Independence of the Eastern Iowa Corridor, two community organizations who promote the inclusion and self-determination of Iowa’s disabled population. To register before the event day, please click below or visit our Eventbrite page here. A registration table will be set up at the entrance to the event if you wish to register that day. Registration will get you access to the event activities including the raffle drawings, which will be available for participation throughout the day.